The finest possible setting for our get together. We had been living in our village for just over a year when I was invited to the annual meeting of The Church Flower Committee. When I first wrote a post about our arrival I noted that we were viewed by the residents here in much the same way as the newcomers in Marghanita Laski's "The Village" . Essentially people wanted to know: who were we, where had we come from, and what benefits could we offer to the village? Charles, by far the more extrovert of the two of us, has been happily singing in the choir and directing traffic to the car park on such occasions as demand it, whilst I quickly discovered that living in cottage so set back from the road that no courier company can ever find it, is no deterrent to being fished out of the kitchen by more determined members of our community. A friend recommended Agatha Raisin's adventures to me, and I laughed my way through many hours as I not only realised that many villages are in fact quite similar in their archetypal residents, but mainly as I recognised myself as the newcomer who missed the anonymity of London whilst also taking comfort in a more relaxed existence in the countryside. And so I found myself at my first ever Committee meeting. It was largely as I had imagined it would be with tea and cakes and a very efficient looking agenda. Rotas for the year were discussed, as was the annual Flower Committee outing, and I successfully kept my head down until the subject of flower equipment and specifically floral foam came up. Complaints were made that it was being reused and perhaps not stored in the tidiest way possible and solutions were being sought. I asked if we really needed to use floral foam at all. I'd been working up to asking the question anyway, but feared it might be an unpopular one, but when the opportunity presented itself to gently enquire about it, I couldn't help but ask. I talked a little about why it really wasn't good for the environment, trying to engage rather than to lecture. To my surprise, no one was against the idea of doing away with the nasty green stuff, but on one condition - that I should give a demonstration of working with chicken wire on an appointed date. Wendy's very delicious, potato based, gluten free lemon cake. I mentioned to the lady behind the No to Floral Foam account that I had been asked to make this presentation, and she asked me to let her know how it went and if I had any thoughts afterwards. So the purpose of this post is really to share some thoughts with anyone thinking of doing the same thing. It was definitely a worthwhile thing to do and I'm very grateful to the Flower Committee for coming along and taking the time to listen to my thoughts and suggestions. That said, there are a few things it's worth knowing before embarking upon such a venture. At the outset, it's probably worth starting by perhaps stating the obvious. A Flower Committee is quite unlike any other audience I've had. I knew it might be a tough gig for a numbers of reasons. Firstly, many of the ladies there have been doing the flowers for a lot longer than I've been posting on Instagram - many remember using chicken wire when Constance Spry first made it fashionable and before the availability of floral foam. So I tried to remember this at all times as I made my creations - respect is definitely key. No one wants a young pretender telling them with a flourish things they might have known for decades. So far so good, I like to think I gauged this part correctly. As this was something I was doing for the Church, rather than an exercise in which I hoped pay myself money, as I might ordinarily hope to, affordability was key. There are many ways in which this can be approached. A small contribution was sought by the Head of the Committee from those attending with the majority/deficit being paid by me as a donation to the Church. To try and keep control of costs, as well as buying local flowers from growers, I spent many hours foraging in nearby hedgerows having been given kind permission by the local landowner (who is conveniently married to the Head of the Flower Committee). In total it was effectively two days' work and cost me a little over a hundred pounds. Looking back, I can see that if I had asked for help in certain areas, I could have been more effective in controlling this. If I were to do the event again (which I'm not, but you might be thinking about it), I would definitely ask more forcefully for help with getting everything set up and also I would ask those who had beautiful gardens with flowers growing in them to bring anything that they could spare. Had I made those requests, I'm sure I'd have been met with a positive response, but because I was much in the same mindset as I would be when doing a normal class for which I was charging, I didn't adopt a more collaborative approach. But I should have done. Thirdly. Doing a demonstration in front of a group of people who know each other well, have not had to travel far, and in some cases are attending because they had been asked to, is not the same as doing one in front of a typical class who will be more heavily invested. When teaching the latter, attendees will have made a specific decision to pay money and travel to hear what you have to say. As such, they are likely to be very engaged as you arrange - though hopefully with some friendly chat, no one likes those first ten anxious minutes as everyone is concentrating so hard that they don't say a word! 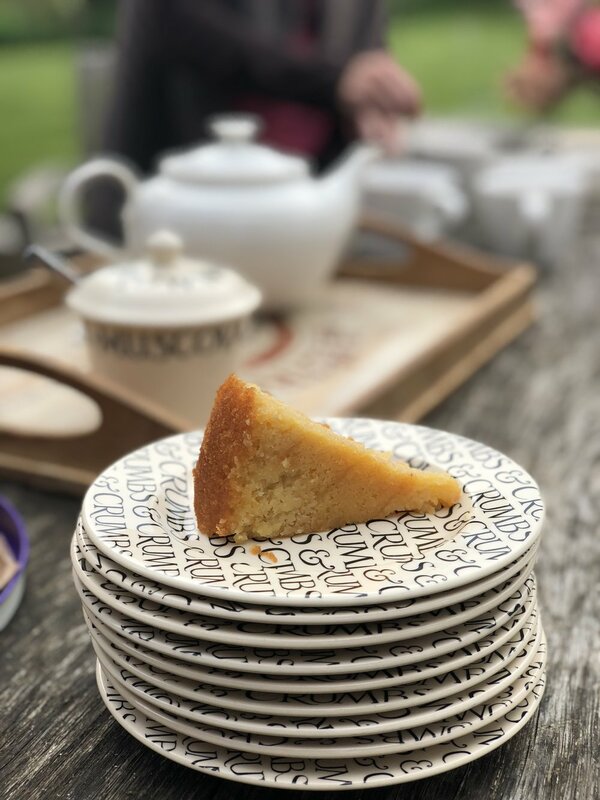 However, an event like a gathering of the Flower Committee - on this occasion hosted in the most beautiful Vicarage with tea and a delicious gluten free, potato based, lemon cake on a sunny afternoon - is a rather different affair. Some people really will be very engaged and join in, other people will be excited to see one another, have news to catch up on, things to talk about and so on. For me it was a good lesson in carrying on regardless of distractions going on around me - I also picked up far more information than anyone realised as they all assumed I couldn't hear as I was so engrossed in my flowers. Luckily for them, I'm terribly discreet. A peony filled Beswick urn. So, caveats aside, what did we actually do? I opted to demonstrate two types of arrangement - one urn type one, and one longer one that might go, say, in a window sill at the side of the Church. I used a Beswick vase that had handily been rescued from the Vestry, plus a zinc window box brought along by one of the attendees. I purchased chicken wire and floral tape which, at the end of the afternoon, went to live in the supplies cupboard in the Church for future use so that as each team did their own flowers, they had everything that they needed. As I didn't want it to a "preachy" affair (preaching is for Vicars after all, and not florists) I tried to focus on the positive reasons not to use floral foam. Of course I touched briefly on why it isn't good for human health or the environment, but I also presented it as a cost saving opportunity. Chicken wire can reused over and over again which means that the cost of buying floral foam is no longer an issue. Additionally I focussed on the fact that putting the stems directly into water meant that a broader range of flowers could be used, as softer stems which wouldn't necessarily withstand being poked into floral foam, in fact sat very nicely in wire. As well as demonstrating that this meant more natural looking arrangements with more movement, I also focussed on how a wider range of foraged ingredients could be used. I took some philadelphus that was growing at the side of a road and plucked of nearly all the of the green foliage, to show it then looked more like a focal flower. This, I am reliably informed, is the thing that most people planned to take away from the afternoon (as well as cake and scandal, one assumes!). I also acquired some pot plants such as begonias and petunias, which I guessed might be on some people's patios, to show how these could also be used as cut flowers too. In doing so, I focussed on saving money as well as the environment, and this, I think, went down well. As to the end result? Well, overall I think it was a success. There has been a clear out of the church flower cupboard, which is now equipped for chicken wire arrangements. There may well be some who choose to stay true to their foam based arrangements, but the large majority seem to be giving this technique a good go, which is as much as I could ask. If we are all really serious about trying to eliminate (or vastly reduce) the use of floral foam, and we are doing it not just for the sake of a hashtag but for the greater good, then maybe it's worth sparing a bit of time to help spread the word amongst those who wouldn't typically attend a workshop that you might be running. As mentioned above, it's possible to be more efficient with time and cash than I was (as in so many other areas of my life! ), and it might just help to reduce the community's footprint that little bit. If you're lucky like me, you'll also get some excellent cake and maybe a few other juicy titbits too! Hilda fulfilled a year long dream of an afternoon spent rolling on her back on a croquet lawn she'd been desperate to investigate further, so from her point of view, that's as good as a summer afternoon gets. The second arrangement was finished indoors since, as at all good British summer events, rain stopped play. It's been a particularly long winter - or so it seems as the snow continued to fall through March, and the rain falls in early Apri - and whilst it's fair to say I think we've all seen enough of it now, it's also provided me the perfect opportunity to indulge in some quality time with all things Agatha (Christie and now Raisin, it turns out). Just a few weeks ago I spent a Sunday afternoon tucked up by the fire watching Murder at the Vicarage. (I'm an avid watcher of ITV3, to the point that there was once a fear I would soon be booking Viking River Cruises, paid for in special £5 commemorative coins). I soon realised that many of the location scenes were familiar, and when everyone filed out of Hambleden Village Hall following an Inquest, I knew for sure that it was new favourite village in the Chilterns. I had recently booked said hall for a flower class and I felt it was a good omen to see it featured in one of my favourite Christie dramatisations. Just a few days later, I spotted it on the cover of this month's Harpers Bazaar, with Lily James (of Downtown Abbey fame) sitting on a bicycle full of flowers. Inside was an article entitled "Best of British" featuring not only the wonderful Lily but also many residents of the village, including some Schnauzers. Over the years Hambleden has been the home to many film sets from Misomer Murders to Nanny McPhee, to Chitty Chitty Bang Bang and 101 Dalmatians. The term "quintessentially English" is perhaps hackneyed and over used, and yet I can't think of a better one to employ on this occasion. With the weather not yet allowing for full-blown British Flowers event, I ventured up to New Covent Garden two days before the class to purchase my selection. I knew I wanted to use Amaryllises, and in days of old I would have bought them more than two days in advance, but a recent incident involving some amaryllises being locked in a room next to a radiator by my husband meant that I now know a very effective way of forcing them open from very tight shut in less than 48 hours. Arriving at the market two working days after Mother's Day was an eye opener, the place was practically deserted and whilst it was lovely to have the chance to chat to traders who were less busy than usual, I felt myself struggling to source everything I wanted. However, I finally left with my stash of amaryllises, cherry blossom, lilac, anemones, butterfly ranunculus, tulips, foliage, hellebores and fritillaries and headed home to prepare them all. The following day, aided by Charles and Hilda, I packed everything up, loaded the car and unloaded at the other end, and set about making the hall look as flowery as I could. Soon people were arriving, the coffee hadn't been made, I wasn't at all sure about the croissants I'd collected in a hurry (neither was anyone else, as they went uneaten), but somehow we started more or less on time. After introductions and a demonstration by me, with the scary first ten minutes where no one says anything at all as they are concentrating intently, everyone quickly settled down and set about the task in hand. The majority of the attendees were experienced florists, some of whom had met each other before, and others who had chatted to each other on social media but were meeting in person for the first time. There's not too much to add, except to show you images of everyone's work that day. It never fails to amaze me how everyone can start off with a similar vessel and have access to the same flowers as their fellow attendees and yet everyone produces somethings very different to the next person. All images are courtesy of the lovely Eva Nemeth, who attended in the capacity of fellow flower student, but couldn't resist taking some pictures. In this, we were jolly lucky. I'm clearly very excited about this hellebore! Definitely asking Eva back in a professional capacity. And there it is. After the class, some had other commitments to go to, and a few of us sloped off round the corner for lunch at the wonderful Stag and Huntsman pub. Lots of chat about plans for the coming season and a few ideas bounced around. Charles was allowed to join us and Hilda sat quietly under the table -so quietly in fact that we forgot to share any of our lunch with her (bad luck, Hilda).Goodbyes and tail wagging followed lunch and soon we were heading home, reflecting that I felt as much as if I'd had a lovely day with friends as I did that I'd had a very busy few days prepping, transporting and demonstrating with flowers. We enjoyed it so much, we are doing it again in late June, having passed our trial run and gained the approval of the Hamblden Parish Council. I'm so looking forward to summer, balmy days in (effectively) St Mary Mead, and roses and meeting more flowery friends, with Eva documenting it all for everyone's portfolios. Details to follow very soon. It's the beginning of another year (more or less), a time when so many of us sit down and think about our resolutions for the coming twelve months. As well as setting new intentions, I like to look back and see what I was thinking at the same time last year and how I got on with those goals - spend more time outdoors (tick), increase exercise (tick), start growing my own flowers (tick), read more books (tick), eat more healthily (almost), only buy clothes I absolutely need (*coughs*). I've also been thinking a lot about how Honeysuckle and Hilda has evolved and have been looking back on my hopes and dreams for it when I finally created a website about a year ago and laid out my ideals. In all honesty, I was worried that I had been too regimented in applying every possible environmental consideration to my way of living and my business. It certainly isn't always easy. In an ideal world, I'd be delivering my organic, home grown flowers in a super eco vehicle fuelled entirely by compost from the heap on my farm whilst Walt Disney animated birds fly along behind me and I sing along like Snow White; the squirrels wave from the trees as we pass. The reality? It's the middle of winter, I don't have as much as a hellebore in my garden, I'm desperately envious of all those diesel 4 x4 s that look so good on Instagram shoots, Hilda has chased all the squirrels out of the cutting patch, and whilst Charles is now a fully fledged member of the Church choir, I have been mysteriously overlooked. Of course, some progress been made. There has been a move to the countryside and the beginnings of a cutting garden. And more: after a long discussion with car manufacturers about the merits of diesel, petrol and electric cars, I purchased a nearly new petrol Skoda. I gave serious thought to an electric one but, practicalities aside, the fact remains that before these eco cars can move, the electricity that goes into them still has to be generated in a way that causes pollution and so, on balance, I decided a second hand petrol car from a company with a strong emphasis on its development process (for further reducing emissions), on recycling the parts of a vehicle at the end of its life, and one that has won awards for its commitment to environmental protection was the most expedient choice for me. (Hydrogen powered cars will, I suspect, prove a more environmentally friendly option but research in this area has been lagging, meaning that even for someone like me, who changes cars once a decade, I am at least a couple of vehicle choices away from hydrogen being a mainstream option. And meanwhile, I have flowers to collect and deliver and the space in the boot of my Yeti is already bringing me much joy). I'm proud to say that 2017 was a year in which I used no Oasis at all, with the exception of three blocks that were used in a group installation on a retreat I attended in May. I'm now keenly following @nofloralfoam , set up by one lady a community initiative by contributors from all over the world, which is seeking funding for an environmentally friendly alternative to floral foam and asking florists everywhere to share any techniques they have used in place of the nasty green stuff. It's definitely an area that urgently needs to be addressed. I myself even made my own mother's funeral spray using chicken wire and foliage. I noticed our Minister looking at it with a degree of curiosity as probably very few of his congregation arrive under what was, to all extents and purposes, a mini Scottish moor, but I felt happy with it and relieved that even under those circumstances I had stuck to my principles. Back in the countryside, some days were spent this autumn building raised beds of untreated, reclaimed wood and filling them with organic soil and mushroom compost. The bulbs have been planted, the seedlings are in the cold frames, the bare root roses are heeled in for now. I love the idea of using only British grown flowers, as so many of us do, but this year (and possibly for a few to come) I certainly will be also buying some non British flowers in. And even when my garden is flourishing, there will always be the dilemma of what to do in those few months of deepest winter, on the occasions where foraged foliage and lovely dead things alone just aren’t enough. And it is this dilemma that I faced when working on two collaborations this winter, one in mid November for People Tree and one in early January for Miller Harris. It’s always lovely to be approached by a company you admire to work with them (or, in this case, two companies). Both of these create products that are both beautiful and ethical and for me this is something I try hard to achieve in my own area of business. I am a passionate consumer of flowers, and try to leave as small a footprint as possible when I do so, and equally, if I’m going to fail at sticking to only an essential quantity of clothes/ cosmetics, I must at least try to be sure of the manner in which they were produced. I have known People Tree and worn their clothes for many years. I became aware of them when living in Hackney and assisting Katharine Hamnett, fashion designer and environmental campaigner, on a project highlighting the dangers of herbicides. First I began shopping in 69b Boutique an outlet specialising in eco clothing, amongst which was the range by People Tree. In 2013 I began to read more about the cotton industry and went to talks given by Peter Melchett, (Policy Director at the Soil Association), Safia Minney (CEO of People Tree) and Romy Fraser (founder of Neals Yard), and did my own research into the conditions of workers on non organic cotton farms. What I read and learnt as a result has given me many sleepless nights. Apart from the shocking rates of suicide amongst cotton farmers who have become slaves (both metaphorically and, alas, almost literally) to the largest GMO producers to whom they remain forever in debt, the production of organic cotton saves precious water, helps to combat climate change and helps farmers feed their families. In an interview with Safia, Peter tells us that “Cotton is produced by some of the poorest communities in the world where the impacts of climate change are felt most severely. Buying organic cotton is a simple way that we, in the West, can contribute to reducing the impacts of climate change, as amongst other things, organic cotton is proven to save and protect water resources and reduce carbon emissions. For example, the water pollution impact of organic has been shown to be 98% less than non-organic cotton production”. But People Tree don’t just care about the environment, their Fair Trade ethics put people at the centre of the way they do business. It promotes and protects the cultural identity and traditional skills of small producers and ensures that they are treated fairly. For these reaons, I have been a proud consumer of ethical clothing wherever possible, and so to be asked by People Tree to give a demonstration at their Christmas brunch was, for me, a very exciting proposition. At the same time, it did also throw up a few problems for me. I had spent the spring and summer using British flowers, more often than not sourced from Green and Gorgeous which is just three miles from our current home. This brunch, however, was in November, when even the most stalwart of dahlias had died off and most native flowers had gone to sleep for the rest of the year. And so, what to do? The first, and most obvious, port of call, was to get my walking boots on and take the dog for a good old forage around the hedgerows of Oxfordshire. A few hours’ walk for Hilda meant armfuls of curving branches, pines, viburnum berries, rosehips, grasses and plenty of dead, crispy bits. An abrupt stop as we drove home also resulted in several long tendrils of jasmine that were trailing down a back wall - just enough to make an impact, but not so many as to decimate the beautiful display for everyone else. Nevertheless, a trip to the market was necessary, and so I headed up early to Covent Garden, where upon close inspection of all the labels on the packaging, I found that many had symbols or kite marks verifying the provenance of the flowers’ origins. In the end I came home with amaryllises (of course), chrysanthemums, lisianthus and hellebores. All from Holland, which meant flower miles, but generally sporting assurances that there had been no human suffering. To these I also added some eucalyptus from GB Foliage -David tells me that 80% of his stock is British but a little of it comes from further afield. It is perhaps a small irony, then, that the colours of the Italian eucalyptus won me over, but I’m not claiming perfection here, only that I’m thinking hard and I’m really trying to do the right thing. And not only that, I was still able to produce something I was really happy with without buying anything of unknown provenance. It was such a pleasure to work with People Tree, who were honestly the nicest team a girl could wish for (they even helped me load and unload my flowers in a Shoreditch side street) and to be able to stand in front of a group of ethically minded bloggers and journalists with a clear conscience was, to me, a sign that I was taking my brand in the direction I had planned to when I first conceived Honeysuckle and Hilda. One thing I am conscious of as I go about the business of flowers is that, in the process of being as environmentally friendly as reasonably possible, I don’t want to sacrifice the beauty of the piece that I am creating. This is something that People Tree have mastered so well - their clothes are ones that I would absolutely want to (and do) wear, and nothing on the stylistic front has been compromised in the process. You can read more about their take on the day here. And that, aside from a very personal flower tribute and some Christmas wreaths from foraged goods, should have been all the flower work I had planned for some time, until the tulips, fritillaries and muscari started to poke their heads out of the beds in late March/ April. But just before Christmas, another email popped up in my in box, this time from Miller Harris, asking if I’d like to collaborate with them again to produce a set of images to be delivered by mid January for two new fragrances that they were launching. I have on the whole been very lucky with the companies who have asked me to collaborate with them, and like People Tree, the team at Miller Harris have been a lovely lot. Hilda and I met them in person few months ago when we were invited to model their Christmas hats, and it was very jolly affair. Furthermore, these products were inspired by a passage from one of my favourite books. However, another good reason for me to like Miller Harris is for their ethical stance in relation to the production of their fragrances. As well as using only natural ingredients, Miller Harris products are both cruelty free and vegan. I had to break it to my sister that I wouldn't be buying her favourite brand of make up this year because they had decided to start supplying their products to China, who by law are now required to test on animals in order to sell there. How lucky, then, that I could instead offer her some products sent to me by Miller Harris, (a generous gift from them), a company that do not sell in China for precisely this reason. And, of course, the happy coincidence of promoting a vegan brand during Veganuary, was a hashtaggers dream! I have been a committed vegetarian for over 25 years, and have dabbled with being a vegan, but then seem to fall off the wagon for various reasons. I got back on that wagon again for Veganuary and (two poached organic eggs on top of my kale one morning notwithstanding) I’m just about hanging in there. I’m hoping it will be for keeps this time. Whatever the outcome, the promotion of cruelty free products can only help to strengthen my resolve to go as gently as I can in this world. When reading the press release for the Tender x Scherzo launch, two things struck me. One was that the author of one of the fragrances was French perfumer Bertrand Duchafour, known for his ethical and environmental commitment and part of the Technicoflor team in Paris (in response to the increasing global demand for "natural" products, so strongly felt in the fragrance field, TechnicoFlor has adopted a responsible and committed approach to environmental protection. A range of natural products has been specially developed as part of their portfolio). And then, an alarm bell. One of the perfume’s listed heart notes was leather. My heart sank. I had been striving hard to focus on positive collaborations, but how could it be claimed it was a vegan product when leather had been involved in its manufacture. I emailed the PR company in haste to see if there had been a mistake. Within 20 minutes I had a very cheerful reply reassuring me that the leather note is made from a blend of natural oils such as saffron, birch, juniper, cade oil, and cistus labdamum. This blend gives the impression of the animalistic notes of leather. Yes, that clever. And that careful in their use of ingredients. And that makes Miller Harris another ideal partner for Honeysuckle and Hilda. And, just as their natural ingredients are sourced from around the world, they are carefully selected in the same way that I can’t always find the ingredients that I would like to during the winter in the UK. And maybe that’s ok. Amy Stewart, in her book Gilding The Lily, recognises that the debate over the environmental and socioecological impact of imported flowers began in this country when others were just beginning to consider food miles. Does it make more sense to import roses from Kenya or to buy them from an artificially lit and heated Dutch greenhouse and truck them to market? Or do we only buy them during their growing season on native soil? As Amy says, there are no easy answers to these questions. Every year, often around Valentine’s Day, a paper will run a story warning us that behind every Latin American or African rose is an exploited worker or poisoned river, and there’s some truth to that story. Amy has seen first hand women in Ecuador dipping long stemmed roses into fungicide. She has, however, also spoken with famers in Kenya and Latin America who are determined to provide good jobs and to farm in an environmentally sound manner. (The Real Flower Company, I would add, is one example of a company who pride themselves on their Fairtrade roses grown in Kenya and shipped via passenger aeroplanes). From the perspective of these farmers, the path out of poverty must involve selling their goods to wealthier nations where the market is stronger. On the other hand, movements such as the British Flower Collective and Flowers from the Farm make a strong case for buying seasonal flowers from local producers, and the #britishflowers hashtag has shown there is a strong appetite for them in the industry. I am reminded of a trip to Cornwall to spend a day learning from Susanne of The Blue Carrot, when I asked her, as we stood in her glorious cutting garden, if she only used British flowers. She told me that she tried to grow everything that she needed and to always work seasonally, but, if she needed to source something to make her work complete, just like another type of artist might seek paint, then she didn’t feel bad about doing so. And I think that’s a pretty good place to be. In addition to Gilding the Lily, another book by currently my bedside is Conscious Capitalism by John Mackey and Raj Sisodia. I’m not going to be disingenuous and pretend to have read and analysed the entire work - I’m not sure anyone would still be reading this is I started talking about the Interdependence of Stakeholders anyway. And as for the parts about the conscious significantly outperforming the traditional model on financial criteria …well, I think I’d have to make some sort of profit to start with. Or maybe perhaps break even this year…? But there are parts that seem very salient to even a modest floral design business like my own. In this work, the authors notes that the greatest change that we as humans are experiencing is in our rising consciousness. “To be more conscious means to be fully awake and mindful, to see more clearly, and to fully understand all the consequences … of our actions”. And it occurred to me as I read this, that to be more conscious would be a perfect Resolution for 2018 rather than the earlier, more traditional ones relating to appearance or generally beating oneself up for not being perfect. This year I choose to be kinder, not only to myself but to the world at large - both of these collaborations are a reflection of that resolution. I had lunch with some old school friends a few weeks’ ago. I talked to them about what I had been doing and my plans for the year ahead. One shiftily eyed her diesel 4 x4 parked outside as she adjusted the fur trim on her cardigan. “But what happened to the old Gourmet we used to know? She was a bit of a spoilt brat” (I pointed out that 30 years had since elapsed) “Nevertheless, I miss her...”, she replied, wistfully . “Very true. But how lucky am I that use the most beautiful flowers, wear the most flattering clothes and smell incredible whilst still sticking to my guns?”. We pondered for a while on what my new title should be, whilst picking over some organic superfoods we thought we should be eating. “How about a conscious brat?” I asked. Heads nodded in agreement. Self knowledge is a wonderful thing. It's been a while since I actually sat down and tried to write a blog post - so much has happened with house moves, funerals, weddings and even an exciting project to work on and so I'm terribly behind with all my posts. I have five half written drafts stored in my website. I was deciding which one to actually finish this week, when a set of the most beautiful images by Louise of Taylor and Porter dropped in my in box, and suddenly I thought of so many things I wanted to say. 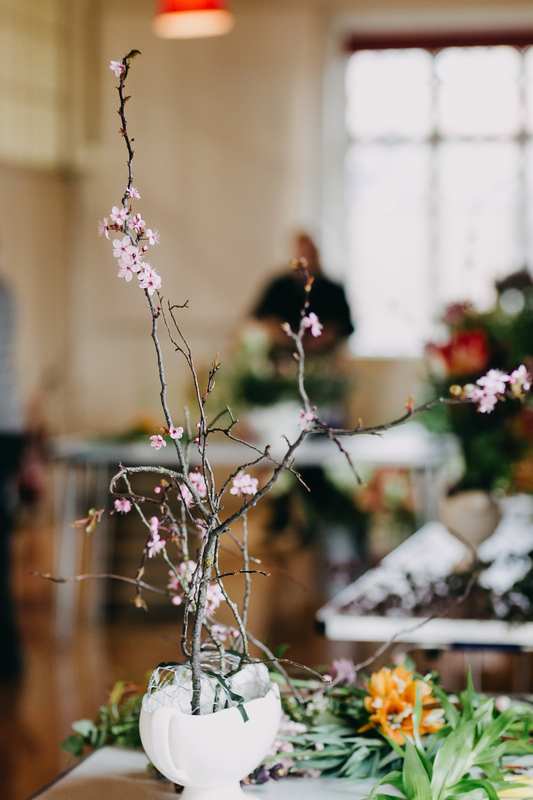 April marked exactly a year since I decided to try and make a go of some sort of floral career, and this time last year I headed off to St Giles in Dorset for the Ponderosa and Thyme workshop. Lots had happened since then, and it's already well documented just how wonderful and positive that experience was, and how many dear friends made - and yet, setting off from St Pancras International, I still had my fair share of nerves, but there was also plenty of excitement too. It's a difficult thing to decide which kind of workshop to go on. After all, it's a big investment in oneself, and (for me anyway) a lot of thinking has to go into it. Last year's retreat was a huge step forward for me and, as I had very little experience, it had been easy to fall for Katie's incredible style, and her compassion that was conveyed in all her images. But this year, I knew I had to build upon those foundations. I first found out about Emily of Fleuropean's business from Susanne at The Blue Carrot when she gave me some of her ribbon to tie my bouquet. That ribbon had many other lives before being cut into smaller pieces used to tie Christmas decorations onto the tree. There was a degree of protest from the Bowen household when I changed the entire colour scheme for the tree in order for it to work with this one piece of ribbon. Luckily some competitive family members came round and expressed such admiration for said ribbon/ decorations and colour scheme, plus a determination to do the same to their tree next year, that my husband had a rare moment of proverbial chest beating, and what had been a sore point soon became one of great pride. I am already wondering what I can get away with this year, but armed with the knowledge that competitive festive decoration can be an excuse for a little bit of prop shopping, I'm mentally making that list. The festive tableaux could well be amazing. But I digress. When Emily posted that she was doing a workshop in Belgium that involved a class in natural dyes for ribbons, I immediately saw an opportunity to try out a new skill. When I saw she was hosting it jointly with Madison of Hart Floral - who has a lightness of touch in her work that I so admire but could never replicate - I could immediately see the potential to take my craft forward. I mentioned on Instagram that I was thinking about it very seriously when some other people, whose work I had been admiring and following some time (that's you, Sarah, Betany and Jasmine) all said they were going and please could I join in. And so I did. After gathering at Liege station, we were whisked off to the most beautiful Belgian farmhouse. We ran off and chose our rooms, bunking up in doubles and triples, and after an explore sat down to a wonderful dinner prepared by Eric, under a blossom chandelier erected by Madison. The real work started the next morning, though, beginning with a foraging trip to find materials both for making natural dye from and for our arrangements to be made later on. We went up and down the gently rolling (ha!) countryside, and collected meadowsweet, alder and dandelions, shouting across to Emily "will this work?" every time we found an item we hadn't previously asked about. Back in the farmhouse kitchen, we set about making dyes for the ribbons, runners and aprons that had been given to us. Emily had already prepared some other dyes (walnuts, avocado stones and many others), which were boiling on the stove in readiness for us. Given how many of us there were around that kitchen table, I have to say just how proud I was of us all that there were no serious spats as to who was going first, and who was using which dye. This was probably because it was all lovely, and if we ran out of anything, Emily cheerfully made another batch, but still I think this was the first time I caught a glimpse of the teamwork that was going to get us girls though the next few days. As our ribbons were hanging out to dry in the garden... or in some cases, flapping around in the ground after not being secured properly (ahem! ), we had grabbed some lunch and then headed off to Emily's home to raid her garden for some tulips and other floral delicacies for the afternoon's arrangement making. I am still a little ashamed of just how many tulips I gathered up that day (sorry, Emily) but I did use every one and having unfettered access to the garden was an absolute highlight of the trip to Belgium for me. It's hard to describe the pleasure of picking tulips in Belgium, on a sunny spring day, in beautiful countryside with cows mooing contentedly - and such fresh air! - and anyway I don't want to sound too much like Gray's Elegy so I'll just get back to the task in hand. Once we had headed back with our spoils, Madison did a demonstration of the most considered placement of dogwood and tulips. I was pretty amazed at how such an impact could be made with a small bowl and such a limited number of ingredients. I was also concerned about whether or not I would be able to restrain myself from throwing all the amazing pickings I had together in one huge, splendid gesture, which is a basic instinct for me, but perhaps not what I had come to learn. It started well, with dogwood on one side and darker elements on the other, but soon my old friends the fritillaries and hellebores were making their way into the arrangement... however, I can honestly say that the arrangement I made was, for me, so restrained and understated that I was really surprised that I had achieved it. As Madison herself said, she didn't want to see a dozen Madisons, but I could clearly the influence her demonstration had had on my work. In fact, we all filled our custom made glazed bowls with a lightness of touch and level of concentration that was quiet impressive. (Footnote: I say "all", there was one notable exception to that statement, as the sassy one amongst us chose her own vessel in the kitchen and recreated the entire Belgian countryside in her corner of the workshop, but my goodness, it was amazing and we all loved her for it!). After another evening of wine, chat and delicious food from Eric, the following day our tasks were to do an installation involving wisteria that had mysteriously appeared overnight, following a trip made to a car park somewhere in Belgium under the cover of darkness, and also to make our bouquets. Madison gave us direction as we suspended the wisteria from pieces of string that we tied across the room, and watched patiently as we created shapes through a process of trial and error. The result was a light and delicate wisteria wonderland type thing - it was just so pretty! We then watched as the beautiful Anneleen modelled under and interacted with said installation - such a joy to watch so much beauty in one room. Later on, it was Emily's turn to demonstrate, and this time we watched her make the most beautiful bouquet from her homegrown Brownie tulips, with forget me nots and pansies and I think I am going to print a copy of Louise's photograph of it to stick on my wall - some people stick aspirational photos on their fridge of women they would like to look like... well, I am planning to put pictures on my wall of bouquets I wished I had made. That said, I was unusually happy with my own one, and even more so when I saw the photos of Anneleen modelling it in a stunning vintage bridal dress. If I ever start a wall featuring pictures of pieces I'm proud I made, it will definitely be on there. It would only be gracious of me, however, to apologise for the panic I had at the beginning when I realised that the overnight death of my dogwood meant that I was lacking in branchlike structures - thank you to Betany, Melanie and Nora for keeping me calm (and tolerating my distracting concerns when they had their own thing to do) and to Rachel for lending me some of her previously foraged greenery. I was very grateful and remain so. Check out my 1940s overalls!! By this stage, it will come as no surprise that Eric cooked us another delicious supper. By night three, polite conversation had been replaced by giggles and chatter, which as we all know, is infinitely preferable. We had sussed each other's senses of humour, found that we had lots in common and really liked each other quite a lot. But by far the highlight of the evening was Betany's singing. An accomplished Opera singer as well as ridiculously talented floral designer, Betany will be known to many of your as Chloris Floral. This is probably a good moment to mention that one doesn't, as I had erroneously imagined, pronounce that "claw-riss", but rather "Clore-reese". I can see why, it's much more elegant and frankly, I felt a little parochial when I discovered this, so I"m letting you know in advance in case you come across this kind and talented lady. I am gutted that I didn't video her performance under the wisteria, but she brought tears to my eyes and made the hairs on the back of my neck stand on end. At this point, there was one last task - to create a a floral walkway in the fields of Belgium whilst Anneleen wafted through it in another beautiful dress. But I was dead beat and opted to stay in and chat with both Anneleen and Edlynn (the talented make up artist) about life in Belgium. And I'm kind of glad I confessed to being well, older than everybody else and tired and cranky with it, because it gave me just enough energy to get through the final and most fun evening I've had in a quite a while. It was interrupted by my husband, due to catch the Eurotunnel the following morning with Hilda so that she could meet Team Primaveral before travelling en famille to Luxembourg. Having assured me that he absolutely knew where both his and Hilda's passports were before I set off earlier in the week, he called me to ask where I had put said dog's documentation. I reminded him of our earlier conversation and he suggested that I had possibly moved Hilda's passport (remotely, from another country?). Luckily for him, I was distracted by wine and a new fun game taught to us by Rachel which involved zooming in on the least attractive feature in a portrait photograph, taking a screen shot and zooming in again. (I think you had to be there, but if you want a lesson, I'll send you Rachel's account details). Shortly before Christmas, a message dropped in my inbox from Sarah of Simply by Arrangement "Fancy a two night stay in Stamford on 15/2 and 16/2 with me, Brigitte and Lucy? No worries if you don't fancy it...". My reply, by return "Oh my goodness, yes I do!!!". Flowers, you will notice, came last. You don't need me to point out what came first! After a few more exchanges, I found myself offering to cook on the second evening, after a few more queries re likes and dislikes, I discovered one of us is allergic to truffles. I didn't even know that a truffle allergy was a "thing", but I can't tell you how delighted I am to have a friend that has one. It sounds so, well, specific. A little more to-ing and fro-ing on dietary requirements, plus ground rules for vessel hunting (in the end we went for "finders keepers" having rejected my own suggestion of hair pulling and shin kicking) and thus our" Four Goes Foraging" trip was born. How did they know we were coming? As well as Sarah, other attendees were Brigitte of Moss and Stone, and Lucy The Flower Hunter. Although I fell I know Sarah well, I had only met Brigitte and Lucy once before, when we all attended a day's class with Flowerona and The Brand Stylist on a particularly hot summer's day last year. We had all been asked to bring a small example of our work, and Brigitte's had been the most delicate arrangement I had seen. Mine, by contrast, was small, relative to my other arrangements, but still by far the largest in the class. My fabulous choice of dahlia colours, set off by a trademark Dartmouth vase, didn't change the fact that water leaked from it when someone kindly topped up the water levels during class, and I looked across at Bridget's, neatly contained within her wicker basket, I had felt dishevelled on its behalf. However, no matter, because the day passed quickly and soon we were having a cocktail at the end of the day, the three of us bonding over dog chat, a manner in which so many of my friendships coming into being. We spent the first afternoon and evening partly catching up on each other's news, but mainly watching Molly and Hilda play. Molly was full of joy and games, Hilda a little more nonchalant to begin with, but soon she was won over by Molly's infectious enthusiasm and they had fun jumping around on the furniture and later in the pub. I, sadly, did not share my dog's restrained manner upon arrival and chattered far too much about everything under the sun and then fell silent to reflect on this. (It's a sort of social awkwardness I suffer from, but I'm working on it). After a wonderful breakfast that included Brigitte's very delicious home baked spelt bread, which arrived in the aforementioned wicker basket (immaculate as ever), we set off for one of the main events - a foraging trip. As previously documented, there is nothing I like better than a good root around the hedgerows for some foliage and textures, and I really thought I had this pretty well covered. Until, that is, I saw these three in action. As we wandered up a lane towards some fields, I made mental notes of where the berried ivy was growing in abundance and spotted some leafless branches that were throwing some good shapes and might be useful for an arrangement later. So far so good. But as Sarah and I walked Molly and Hilda, we noticed Brigitte and Lucy stopping at places I would never have thought to stop. Some reddish purple foliage was removed by Lucy from the thorniest bushes I had encountered, and their thorns were whittled away by Brigitte. What remained was a beauty I hadn't even envisaged. And as for Brigitte's capacity to find a dead thing and turn it into a piece of art - I hadn't seen anything quite like that either. We all hunted and gathered as we walked along country lanes. Sarah by this stage was also adding to her collection, aided by an enthusiastic Molly, who liked to "prune" things without prior invitation. There was some disapproval of her participation, but actually I think she had spotted what we up to and had decided to make herself useful, which in my book is quite admirable. Good girl, Molly. Not least because Hilda couldn't care less and was off doing her own thing, as usual. We eventually returned back to our cottage, laden with with foliage, dead and alive, and plenty of twigs, some covered in lichen, in readiness for our flower fettling later. After a restorative cup of tea, we headed into Stamford, the first stop being a visit to Miss Pickering's shop. Many years ago, I read an article about Miss Pickering's shop in some glossy magazine or other. I looked her up online and discovered THAT blog. The blog that launched a thousand dreams. The one that rekindled my love of flowers and made me want to start going to classes again. That one. A trip to her shop today is as exciting as it ever was. Valentine was posing in the window, a stork presiding over the flowers in the middle of the premises, watching her hellebores and Julietta roses closely. I squeaked as I spotted "my" vessel, quickly claiming it before anyone else could. Purchases were made, followed by a trip to the Toby Norris for lunch. Then, a trip to the Stamford Antiques Centre. Another eye opener for me. There were so many stalls and hundreds of potential vessels, yet I spotted only two. One was an old green Dartmouth vase (complete with ageing white silk flowers), the other a 1907 large china jug with coral coloured flowers. The latter was almost perfect, and the only thing that stood between us was a nagging voice in my head (or was it Sarah's?) reminding me that I was moving to a smaller house in two weeks' time and already had more vases than I could accommodate. I clung on to it anyway, whilst I grappled with my desire for this vessel versus that for a happy marriage. "It's so lovely' vs "It's also enormous". That kind of thing. Eventually, after wafting round the market a little more, I put it back in its place to see how I felt once parted from it. Yes, I actually do this from time to time. I went to see what the others were doing. Sarah had found a wonderful grey 1950s vase almost next to the green Dartmouth once I had shown her, so I almost helped her find something, which was excellent. Well done, me. Brigitte found one or two vessels also, but the hoard was Lucy's. The star buy was possibly a huge rusting metal urn - I long for one myself but have only ever seen them in Petersham Nurseries with a West London price tag, but this one was gorgeous and a fraction of the price. Sarah had shown it to Lucy and she had swooped. There were a few other pieces, but I was secretly envious of a small pink bowl she had located on her patrol. I hadn't even noticed it, and until I saw it at the till, I wouldn't really have given it much consideration, but in Lucy's hands, I could suddenly see its potential. Lucy, it should be mentioned, grew up surrounded by antiques, and her keen eye was inherited from her parents. We set off home again, congratulating ourselves on having conducted ourselves in such a civilised manner. I was still thinking about the jug a little, but mainly I was thrilled at watching some antique detectives at work. The next time I go out in search of vessels (which is never, if Charles is reading this), I am going to do so with a completely fresh outlook. Once home, we talked earnestly about fettling with flowers and preparing supper before Miss P arrived. We did, however, delay this a little, as Lucy hit the 2k milestone on Instagram, and we felt this needed to be celebrated. Actually, we had been waiting for this to happen for much of the day, and by late afternoon I was considering emailing for some outside help, so that we could have an excuse to crack open a bottle of something delicious. In the end, there was no need and gin and champagne were forthcoming. In addition to foraged items, I had brought a huge bouquet of flowers that my husband had sent me to atone for his ski-ing holiday coinciding with Valentine's Day. And because I had brought a huge bouquet I also brought my favourite huge Beswick vase also. The vase that it generally takes two and a half hours to fill in a manner that I deem to be acceptable. Because the larger the vase, the more room there is for things not to sit properly. And so it was. Not content with the pressure of cooking supper for five, I decided to go large with the flowers beforehand. And it went well, for the first 75-80%. But I couldn't quite finish it off, and had started out as #aquiet_style quickly became #aquiet_tantrum, As Lucy worked quietly on her delicate masterpiece, happy in the knowledge of her 2k followers, I started to panic. Luckily for me, Sarah stepped in, just at the moment I was saying it was rubbish and threatening to take everything out of the vase. After some soothing words, I was persuaded to make two adjustments - first to cut the flowers towards the centre of the arrangement a bit shorter. I've never been terribly brave about this. Secondly, to add some taller plants poking out of the top - not in itself a new thing, but Sarah told me to imagine that a cluster of flowers as if they were springing out of the ground. I hadn't ever thought of it that way before, but once Sarah said it, and I did it, it made perfect sense. And the arrangement went from disaster to, well, at the very least acceptable (given that we had flower royalty joining us for the evening) and in a matter of minutes a crisis was averted. Thank you, Sarah. Soon after, Miss P arrived and we spent a wonderful evening full of chatter (some floral, some not even remotely flower related), wine and tomato risotto, plus a winter salad I had read the recipe for in Kinfolk - of course. Miss P brought chocolate brownies made from black beans that were vegan and gluten free and tasted so much better than I have just made them sound. Valentine, Rutland's most handsome whippet, soon adjusted to hanging around with two girl dogs, and everyone had a pretty fabulous time. The evening passed far too quickly and soon it was time for bed. Before we left the next morning, there was one important task left - the photographing of the arrangements. Lucy identified the best light in the cottage and was soon setting up here scene with books, carefully weighing up rules of thirds, positioning her tripod and generally getting everything ready for maximising her images. I watched carefully. Lucy's work on Instagram is always so beautifully captured by her photographs and I wanted to take the chance to learn from her. She generously took the time to show me some of the things she takes into consideration when lining flowers up, her use of books, looking for light sources, and all the things that I've heard before, and seen in her work, but there is nothing like an artist such a Lucy being there to show you how she actually does it. I took some shots of my own, but made her promise to send me hers, not least for use in this blog. As with Sarah's intervention the night before, and Brigitte's foraging tips the previous day, I was so grateful to learn from Lucy also. And then it really was time to go. We said our goodbyes and we set off in different directions, to Yorkshire, to London and to Suffolk. Two days had passed in a flash, but they are 48 hours that I shall remember for a long time to come. It is Friday 20th January. If this Monday was "Blue Monday", traditionally the most depressing day of the year, then I can't imagine what today is. Because we all know what 20th January 2017 means. I fear it is a date that will long be remembered in history, and for all the wrong reasons. So today I am staying away from all news feeds and focussing instead on all the reasons to be cheerful about January. Good. Did I mention it is also Dry January in our household this year? I have never done one before, mainly for the reason that we tend to need cheering up in January more than any other month. But somehow this year we reached the conclusion that we didn't need to lighten our moods, possibly on account of all the uplifting world events and actually there's nothing better than being the only two people at a wake who are not drinking. Luckily, we didn't give up chocolate as well. That's next month. And in March I am crossing dairy off the list as well. By April, this feed will be so depressing that nobody will be reading it any more and I shall be crying over my keyboard as I blog into a void. Whilst avoiding the real world today, I have spent even more time than usual in the other reality which is Instagram. I learnt that it has 4.2 billion members, 600 million active monthly users and over 150 million of us post on Stories daily. I only concern myself with the ones involving flowers, dog rescues, ethical consumption and of course, micro pigs (current favourite : @oink_itsolive) but something that has struck me this month, is that everyone is posting images of pretty much anything but January. At the end of the year, I really enjoyed joining in the #2016bestnine and even shared a few of my personal favourites, and not even in a Charlie Brooker satirical type round up of the year. However, we are now well into the latter part of January and we are still recapping. I get it, people are really missing the warmth of the summer months and looking forward to a the when roses are back in season. I too am looking forward to seeing the roses, though perhaps not as much as I am to tasting the rosé at this stage of the month... I totally see why posting summer images gives us something to look forward to. But I really try to enjoy each season as it comes and so it seems a little sad to be wishing away these moments with the promise of something better to come. That's right. Il n'y a pas de fleurs. January is possibly the worst month for getting hold of locally grown flowers. I made a good use of a batch of flowers from around the world in my last post to assuage my guilt, but the reality is that there is just so little around. With the obvious exception of my other favourite flower, the hellebore. Unlike my relatively recent, if passionate, love for the amaryllis, my love for the hellebore is long standing and constant. There are gorgeous on their own, and make any arrangement immediately better. They have their own #helleboreappreciationsociety hashtag and who can resist a lovely image of some hellebores? But then what? If we aren't to overload our feeds with a wistful glance (or ten) back to the summer months, then what else are we to do? Well, for one thing we could look forward to Spring. One of my new favourite hashtags de jour is #signsofspring , another is #seasonalshift. Today I posted a flat lay of some paper whites and narcissus on top of another piece of music entitled "Narcissus". Was it a coincidence that my husband, who plays the piano very beautifully, by the way, happened to own this piece of vintage music? Or did I spend days trawling Ebay and Etsy for vintage sheet music and finally come across this as a possibility for a dark and gloomy day? Did I also stumble across another piece of music entitled "Dance of the Flowers" (but in French) and spot a way to cover the -s- and make quick joke about January? Either way, it made for a relatively guilt free piece and a giggle respectively, so I guess it doesn't matter. But apart from that, I'm bit stumped. I had been saving some images taken at the Ponderosa and Thyme workshop last April and had thought it might be nice to share a couple now and again, like once every few weeks, in order to build up to the arrival of actual British flowers. But, alas, I have been well and truly beaten to the post on that front, and I don't want to be like P.G. Wodehouse's Tuppy Glossop singing "Sonny Boy" for the umpteenth time to a rotten tomato throwing crowd. If you have a few minutes to spare, and are not familiar with the scene, or would like to be reminded of it, here it is.... it's quite fun and in itself an antidote to the January blues. Meanwhile, back to the case in point. If there are no British flowers, and posting photos of earlier workshops and roses from last summer ad finitum are devices to be avoided, then what on earth is one to do? I had planned more flat lays and was reaching for my Observer's Book of Wild Flowers - it has a lovely green cover and works perfectly in my grid's colour scheme. But, a quick survey of Instagram shows me that, again, I have been pipped to the post. I wonder how many copies of said book are in circulation,several decades after it went out of print...? A dear friend and respected floral designer has posted her a photo of hers with narcissus on top and, I am sure, near identical grey velvet ribbon to that which I too purchased in VV Rouleaux before Christmas. All of which leaves me with a First World, decidedly Middle Class Crisis, of what on earth I can possibly post without vaguely crossing over with someone else's ideas and/or breaking my environmental code of ethics...? And the answer is, I'm not sure that I can. To keep my account going, I'm going to do a bit of foraging in the Cotswolds this week, but I'm going to buy a small amount of flowers too, and there is a chance that not all of them will be British. One of my favourite flower friends, Jenn Pinder, announced this week that she is aiming to be 100% British by 2020, and I think that's a great goal. Given my hopes to be planting seeds and bulbs in the latter part of 2017, I think I may give myself a similar time frame. But if, later this week, you see posts of flowers adorning the National Trust Cottage in Snowshill that we are currently renting, possibly with The Observer's Book of Wild Flowers beside it, do forgive me. We are none of us perfect, least of all I. Next week: A cottage full of flowers in Snowshill, Broadway! It's been a busy few weeks of visiting relatives and receiving guests, and last month I tried really hard to post as many festive florals onto my Instagram as I reasonably could. It has finally caught up with me today, and suddenly I am tired beyond measure. I started running a hot bath, and surveyed my new box of Aromatherapy Associates oils. Each year, their Christmas boxes get a little bigger in their selection of choices "Light relax", "Deep relax" "Revive morning" "Revive evening" "Support breathe" " Support Equilibrium"... and so on. Today I searched in vain for "Holy Crap, I'm actually dying", but it appears that one hasn't yet reached the production stages. Too bad, as that is definitely the one I needed at that moment. Perhaps when the next online survey pops up, I'll recommend that they consider it. Anyway. Having lowered myself into the tub, I looked on the bright side, insofar as I had made good use of my recent flower acquisitions and created not one, but five different pieces from the same set of blooms. As has been well documented - some might say to the point of being boring - I really do try to use British grown flowers where possible, but recent circumstances had seen me acquiring all manner of flowers from various provenances. A pang of conscience, combined with Scottish thriftiness, meant that I had undertaken to use the materials more than once, so that I could build up a set of images to post over the next few days. This meant the pressure was off for a little at least. Or so I thought. Because no sooner had I thought this than a comment under my last IG post popped up, badgering me about writing blog posts more often, or some such nonsense. And just a few minutes later, a text from someone else saying the same thing. Pft. I hadn't even begun to imagine what another post would look like. What on earth could I reasonably write about, given that the only thing I had done was to create several pieces from the same set of (predominantly) pink flowers? When I think of anything pink, more often than not I think of the term "Pretty in Pink" which, in itself, points back to my taste in cheesy 80s films and clothes. After all, it's not that long since I referenced Ally Sheedy emptying out her handbag in The Breakfast Club, and to progress to Molly Ringwald just because the flowers I used were pink seemed a bit lazy. I lay back, I submerged myself a little further in the water and drifted off into a land of Andrew McCarthy and James Spader, a land of fingerless lace gloves and other 80s fashion accessories and then it came to me. To be really honest, it's still a bit tenuous, but for now it's all I've got. First of all, I need to start with the unfinished arrangement I had tried to pull together, but hadn't quite finished, earlier in the week, together with the bouquet of flowers brought down from Yorkshire by Katie of Ponderosa and Thyme. And, then, a second flat lay. By now, as everyone entered Blue Monday, my Instagram feed was looking decidedly pink. But, fear nor, the ubiquitous bun tin, beloved of so many Instagrammers, was put to good use, so I was at least channelling the right devices. And, lastly, for those of you holding your hands in despair, thinking that I don't know that Rose Quartz was Pantone Colour of the Year in 2016, and that this year we are all about Greenery - here is a foliage only bouquet that I inadvertently made whilst tidying up from the flat lay. I am considering the "man bouquet" as a natural progression from other Metrosexual accoutrements such as the "man bag". This one was reluctantly modelled by my poor husband who was only prepared to show a little bit of lower arm, still smarting as he is from a 4 year old child enquiring of him at the weekend whether he had accidentally swallowed a pumpkin. I guess that's the problem with four year old children occasionally saying the wrong thing. When this one grows up a little more, he will discover the the world of social media is such that no self-respecting floral designer would have a pumpkin or any other kind of gourd in her home beyond November. But he is still young, and has much to learn! And lastly, a postscript, which is a reference to my other favourite Molly. I haven't even met her yet. but just before Christmas, there was another girl from the wrong side of the tracks who tugged on the heart strings of someone rather classy. I am pretty sure that if she gets dressed up in anything at all, it won't be pink polka dots and lace. And whatever pack she orginally came from, it wasn't the Brat Pack. So, instead I give you Molly Statham, looking pretty with her little pink nose. Her entry into the world flower fettling is one I am very excited about, and as such, unlike much of this post that precedes this paragraph, she deserves to have attention lavished upon her. I have seen evidence on Instagram she is already being taught to dance by her mistress, so perhaps she too will be at her Prom before long. In a brown velvet gown. You know what I'm saying. It is January 6th. The Christmas tree came down this morning, our dear friends are on their way to Heathrow to fly back to Oregon, and I definitely snaffled the last of the chocolates last night before going to bed. At 10 am this morning, I was feeling a little sad. Hilda was looking glum on the back of the sofa, with big doleful eyes as she watched Katie and Mark pack their bags, as she knows that when people pack their bags, it means they're going away. I decided to go back to the flowers I had started yesterday but hadn't been able to finish. I was frustrated that I had so many different components, sourced from a variety of places, each one so thoughtfully chosen that this post could have been all about Mindful Flower Consumption (as opposed to Mindful Food Consumption). And in a way, it kind of is. Sometimes when I am doing just one piece for myself or, rather, my portfolio, it doesn't make sense to go the market and buy flowers in large quantities, as what I really want is just a little bit of everything. I also find it inspiring to visit other florists to see what they have chosen. This piece started with a quick visit to Zita Elze in Kew. I so often find just one or two inspiring elements I wouldn't have thought of, and that can form the basis of what is to come. It was their first day of opening and the cupboards were a little bare, but they did have the most beautiful pink ranunculus as I walked in. After a chat with Sarah, I came away with just a few of these, plus some dried thyme that was throwing some good shapes, but already the scene was set. The following day, I visited The Real Flower Company in Chelsea, where I purchased six stunning roses. Nothing else. Except more flowery chat, of course. And then, on the way home, I did my favourite part of my flower shop, a visit to see Azar in The Blue Lavender. No one buys flowers the way she does. I used to hang around the front of the shop politely, but these days I have no hesitation in double checking what she also has in the back of her shop. On this visit I found the perfect pink lisianthus to go with my ranunculus. And some pinky white anemones. And spring blossom. Add to this a full handfuls of foliage, and some dried hydrangeas I was drawn to, and things were looking up. Also, there is nothing better than an encouraging hug from Azar. I'm not sure that's how she markets herself, but I'm just putting it out there. I bounced home, happy that I would have made good use of my new Petersham Nurseries vessel by the time that Katie got back to our house after a few days in Yorkshire visiting some pretty badass floral designers with way more experience than me. I was excited that I felt I could create something that would show some progress had been made since I attended Katie's workshop back in April, a piece that might make Katie smile at her part in this development. It started well. I made great shapes with the dried thyme and the blossom branches. I thought of my 121 with Miss Pickering in the summer where I filled a giant urn as she instructed me on forming a sweeping, left to right, diagonal kind of shape. I put in the key pieces of ranunculus, roses and lisianthus, with a wiggly anemone going off to one side, just as Susanne of The Blue Carrot had taught me. All I had to do was fill in the gaps with the remaining foliage. But, try as I might, I couldn't quite get to a point that I was happy with. Ironically, it was Katie herself who taught me that, in this situation, the best thing I could do was walk away from it for a bit and take a rest. But I so wanted to get this right precisely because she was coming back for one last night. As background context, when Katie first mailed me to say she was coming over to England just after Christmas with her husband Mark, and when she took me up on my offer of making use of our spare room, I was at least as anxious as I was excited. Poor Charles, who had successfully avoided making a decision on the colour of our front door for at least two years after the rest of the house was finished, was sent to Homebase within half an hour of the news. I ignored my husband's campaign to only use fitted sheets that don't quite fit the new beds and went off in search of new ones. I got in touch with lovely, lovely Jenn Pinder (who I also met on the Ponderosa and Thyme workshop) to see when she might be free to join us for dinner. Pumpkins were roasted, homemade mushroom stock for the risotto went on the boil the day before and all the ribbons on the Christmas tree baubles were tied in a carefully staged "haphazard" manner in the finest silk ribbons I had saved from workshops throughout the year. So far so good. I knew from the first few days of Katie and Mark's stay that they were pretty good houseguests and I had almost grown relaxed around them. 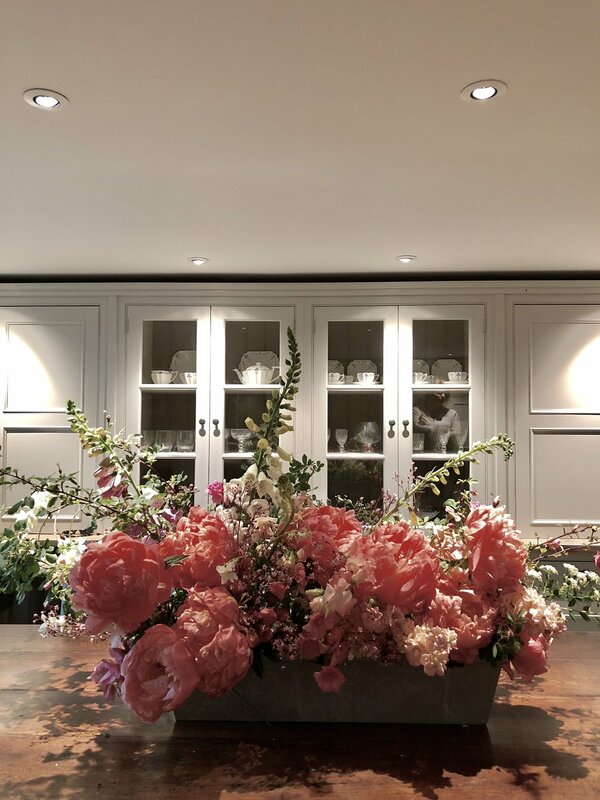 After all, they are first and foremost friends, and I was starting to get over the fact that Katie is, you know, one of the world's greatest floral designers. But when I saw the photos of her exploits up north, the anxiety started to creep back in. I had made a new friend in their absence - Susanna Luck, a friend of theirs from Oregon who was also over in the UK. We had met for coffee earlier that day, I discovered she is super nice, and she had agreed to come over for supper on Katie and Mark's last night. As well as picking up flowers, I shopped for wild mushroom soup, for pates and cheese and fresh bread and salad. I laid the table and lit the candles, and, though the flowers were only half done, I felt so pleased when everyone crossed the threshold in one happy throng. And then - such an honour- Katie handed me a bouquet that she had made whilst on her travels in Yorkshire. I was beyond excited. Except that she said the flowers were a bit droopy as they had been out of water, and maybe I could take the bouquet apart and use the better flowers in a flat lay or my own arrangement. It's funny, really, because shortly before Christmas, Marcus Wareing brought round a meal he had cooked for us and suggested that I fry it and cover it in tomato ketchup. And then there was that time Ben Nicolson turned up with a painting and said he thought I might find the canvas useful for a new work... okay, not really, but you see where I am going, the thought of taking Katie's work apart to use the components myself felt like madness. Instead, I did what any sensible floral designer near the beginning of her career would do, I took a photo and put it on Instagram Stories, saying "look what Ponderosa and Thyme brought me". Was I showing off? Maybe a little, but I knew Katie would understand and that every person looking at that story would have done the same thing. We chatted over dinner, we were having a lovely time, and finally I felt that maybe my hosting skills would be remembered as having passed muster. We might not live in St Giles House, but I really thought I had styled this one out. At some point during dinner, I mentioned to Charles that I could notice a smell, but we put it down to the cheese in the absence of any more obvious cause. A little later, Katie popped upstairs. When she came down she told me, gently, that she had found the source of the smell. Cecil, unable to get outside because of our positioning in the kitchen, had decided to do the most enormous poo in the bath. And just for a moment, my world stopped spinning on its axis. I tore upstairs and dealt with the situation, with copious amounts of boiling water and every environmentally cleaner I could lay my hands on. But then, I had to go back downstairs and face my audience, I mean, my guests. After all the planning, and decluttering, and tidying, and front door painting and cooking, I had been totally let down by a cat who had made an inappropriate decision. But I couldn't hide upstairs either. And do you know what Katie said when I rejoined the group...? " Cecil is so thoughtful" (What?). "I mean, he couldn't get outside so he chose a place that he knew you could clean easily. I reckon you could train him to use the loo. You hear of people doing that". And then, before I knew it, there we were, all five of us, debating the possibility of a cat being trainable in the way that a child might be potty trained. And at that moment, I knew I was really amongst friends. I mean, I already knew, but then I really knew. And it didn't matter that the flowers weren't finished. Is Cecil thoughtful? I don't know but, Katie, you most definitely are. And so, once our guests were gone, having first photographed me in my dressing gown, pre shower, (for which, thank you) I turned my attention back to the flowers. And I surveyed the ingredients I actually had in front of me. I thought of the people I had chatted to as I chose those components. I thought of all the people who had taught me in the last year, and how I had all their teachings to draw upon. Then I looked across at the bouquet that Katie had brought back with her the previous evening. The one she told me to take apart and use in my own work. I took a deep breath and got out the scissors and started cutting through the floral tape. I laid out everything very carefully. And then I started to build in more layers. I used the berried ivy, and the amaryllises, and two (not very British) anthurium ... I added Katie's lisianthus in two different shades of pink to the ones I myself had purchased. And so it grew into something, dare I say it, rather lovely. Although I love to share my images on Instagram, and am flattered to hear that some people even read this blog, it is only every so often that I look at a piece of my own work and think "good job". But this is one of those arrangements. If it were a film, I don't think it would necessarily win an Oscar, but if it did I would have to stand up there and acknowledge the love and help of a long list of people that helped to make it what it was: the flower growers, whose names I don't know, Zita Elze, Azar of the Blue Lavender and the Real Flower Company for stocking such beautiful things, Miss Pickering and The Blue Carrot for all their teachings on shape, and Katie for both her incredible encouragement and also for the flowers she brought down from Yorkshire and the kindness and love she showed to me on this visit. It sounds dramatic, I know, but when I look at this image, that is the anatomy of the moment I see before me. Is it a key event in contemporary European History? Would Javier Cercas think it worthy of comment? Probably not. Is this blog post self indulgent and over the top? Almost certainly. But to me this piece represents everything I have learned so far and a lot of wisdom and kindness that have been extended to me, and, as such, I felt it merited at least an honourable mention. I am hoping there will be a few more such moments in 2017. 2016 - when Donald Trump became President Elect and then told Americans how he didn't mean much of what he said during his campaign, when we voted to break up the EU after a contest largely centred upon some lies written on the side of a bus, and the moment when "post-truth" was named Word of the Year by the Oxford Dictionaries. I find this latter concept especially difficult as, to my mind, putting a hyphen between the prefix and the noun makes it two words rather than one, but I've double checked online and that's definitely what they're calling it/them. I've watched enough editions of Pointless to know that Richard Osman wouldn't allow a hyphenated word in one of his "words ending in -ent" rounds, but then nothing much that has happened this year makes any sense anyway. "Today is winter as it always was, and when it wasn't it was not remembered. Forgotten, now, are the small freaks of weather, the offbeat heatwaves and wet-warm Decembers that have cropped up now and then in the past. Winter was always like this since the beginning of winters, since the first man learned to sneeze". Laurie Lee, it seems, understood about post-truths long before most of us were born. (Though I don't think he would have approved of that hyphen either). And so it was today. Whilst our Christmas involved more than a week of older relatives who were either very sick or bad tempered - or both - this morning we woke to an empty house, no fixed agenda and a bouncy little dog. We rose early and headed off to Ham, by Richmond Park. The sun was low in the sky, and the frost had covered the ground and trees so completely that I really thought (hoped) that Tilda Swinton might come around the corner in The White Witch's sleigh, or that Mr Tumnus might pop out from behind a tree. And I finally began to feel festive. And happy. We didn't talk much during the course of the few hours it took us to complete our circuit, we were so busy stopping to look at the light coming through the trees, or to listen to the dripping sound of the ice melting, or to take endless photos on our iPhones, but when we stopped for a congratulatory drink at the pub, we had plenty of thoughts to share. We talked through our goals for 2017, both the big ones and the small. Most of all, we discussed our plans to move to the countryside, the move I had hoped we would have made some time ago, but events got in the way. Realistically, though, we are few months away from this, and I have been trying to decide how best to use the quietest months in the flower year which also coincide with remaining in London. The temptation to devote two or three months solely to Agatha Christie and Dorothy Whipple is very strong indeed, (and it has happened before), but this year I want to make sure that at least some of my hibernation period is productive. Two of my New Year's Resolutions are to see more art and to read more books. Whilst in London, it makes sense to spend more time in The National Gallery, The Victoria and Albert Museum and I can't remember the last time I visited The British Museum. Having lived in the Capital all our lives, we take for granted these places on our doorstep, and so rarely visit them, partly because every day life gets in the way, also because we think there will be another time that we can go. Temporary exhibitions always take precedence over permanent collections, and so trips to galleries focus on those works only there for a finite period of time. The next three months seem like a good time to begin to remedy this. Likewise, this is a good time to be reading books. I have made a fairly extensive list, and I doubt I shall get through them all in the next 12 weeks, but I intend to pay particular attention to the Bronte Sisters (in anticipation of a trip to Yorkshire to visit Simply by Arrangement). Other possibilities include Gilding the Lily by Amy Stewart of course The Tulip by Anna Pavord, which I hope to have read in time for the beginning of the British Tulip Season in the Spring. Other cold weather and rainy day activities include practicing my calligraphy - I own a vast array of metallic and coloured inks, and beautiful parchment like paper from Silk and Willow, and yet I have done so little with them. I am going to dig out my copy of Ink and Nib and my practice notes from Alice Gabb and I shall keep practicing the -y- in that makes my Honeysuckle look so wonky when I write it. And -k- too. I can't seem to master -k-. I also plan to arrange a meticulous library of images, currently spread out across various memory cards, Drop Box, the hard drive of my old laptop and iCloud. But most of all, I am looking forward to taking the time to catch up with other people's blogs and hopefully discover new ones. I am a regular subscriber to the one written by Aesme, and of course Simply By Arrangement (no surprise there), and I am also a big fan of A Quiet Style. I have more recently discovered Mademoiselle Poirot - I have treated to myself to a day's workshop with her in April - and am finding more and more styling blogs really useful. I still look forward to the postings on Miss Pickering's blog, though rare and far between, her economy with words and understated humour are to blogging what the Japanese haiku is to poetry, and every one unique in its own way. Today, however, I finally signed up to Floret Flower Farm's blog. It's a funny thing, but I so want to be able to grow my own flowers that I have been holding off doing so. I can't really explain why. It's not jealousy, per se, that has stopped me from doing so, more a deep rooted (if you'll pardon the pun) frustration and not being able to plant my own tubers any time soon. But finally, it feels like it is time. I won't be using any of my own flowers for weddings this year. I've already missed that planting slot. But if I am putting my own tubers in the ground in the Autumn of 2017 in readiness for the following year, that could be super exciting. "Now the time had come for us to go up to the woods and collect leaves for decorating the house. Among the black and bare trees we shook the snow from the undergrowth with frost-reddened fingers, seeking the sharp-spiked holly, bunches of laurel and ivy, cold clusters of moon-pale mistletoe. With these, we transformed the familiar kitchen into a grotto of shining leaves, an enchanted bower woven from twigs and branches sprinkled with scarlet berries". For me this is the dream. And this is what I shall be hanging onto for the next few months as I organise my photos, bite my bottom lip at the kitchen table whilst pouring over my badly shaped consonants, whilst I read up on the cut flower industry, and devote myself to flower related admin. There will be flat lays too, for sure, and foraged things in new vessel from Petersham Nurseries (a Christmas present to myself). But mainly I shall be daydreaming of the countryside and hoping that 2017 is the year I can finally make my floral aspirations a reality. And with that, Happy New Year. There can be no denying that 2016 has been The Grand Tour of floral designers, worskhops, retreats, 121s, and garden visits. In this respect (i.e. outside of the year that saw the deaths of I don't know how many talented artists whilst the rest of the world hit the auto destruct button), it has been a wonderful year. It was preceded by about two decades of office jobs I didn't enjoy, and a pretty bumpy three years more recently, so I do feel like I earned this one. And whilst Rome has been burning, I have most definitely been fiddling (with flowers). Most of my studying has been in relation to the flowers themselves, how to make do large scale arrangements, make beautiful bouquets of various shapes and sizes, buttonholes, garlanding, wreath making, archways and even a bit of botanical jewellery. And in days gone by, that would have been enough. But in the social media driven age that we live in now, it simply isn't. In order to make our businesses credible, we need to attract followers, and thus the public holds us accountable, measuring our success on Instagram, Pinterest and the like. So it is not just a question of having a lovely product, we also have to be able to present that product to the outside world on an almost daily basis. We need to know our Planoly from our Unum, and to be able to produce a Gorillapod in any situation. In some ways, this is an amazing thing. We can, to a large extent, market ourselves. We don't need to employ PR gurus, or court magazines in the hope of editorial as the only medium through which our works will be seen. I wonder how may florists who don't have a shop would be enjoying so many bookings from their workshops if it wasn't for Instagram. On the other hand, though, we do find ourselves slaves to hashtags (interestingly, my spell check always changes the word "hashtag" to "hostage") and worrying a lot about the images we post. I tell the outside world and other florists that I don't really care, and we laugh about it over a cup of tea from time to time, but when I reached 1,000 followers I was so excited. I was out in Richmond Park when a text flashed up from another florist friend congratulating me on reaching the first milestone. I stopped trying to pose Hilda in amongst some ferns and and a tree trunk to check my account, and sure enough it had happened. Hilda seized her moment and escaped down a river bank, and so was almost as excited as me. I could hear her woofing in celebration about 200 yards away and she was definitely saying "1,000 followers, woohoo!" and not "finally, I can have some fun without being poked with bits of fauna whilst sitting in bits of prickly stuff under the tree". At the Ponderosa and Thyme retreat we had a session on photography led by the wonderful Maria Lamb, as well as one on styling from Katie herself. It was early days for me and at the end of a long week, and I ended up plonking a the wing of a pheasant whose carcass we had found whilst out foraging, next to a lovely piece of mossy bark I came across, with lots of lovely spring blooms. I added quails' eggs for good measure as everyone else had done and of course a pile of old books. Katie was as encouraging as ever, but I could see there was work to be done. Maria took artistic shots of my scene in sections, perhaps because the grouping as a whole was a little overwhelming. When I got home, I purchased Silk and Willow ribbons and fabrics en masse in a sheer fit of enthusiasm, and practiced furiously with both flowers and props. Annoyingly, one of my favourite images came about when I turned my back and Cecil the cat destroyed my taxidermy butterflies. I should have been annoyed, but he told me he was collaborating on a piece about shattered dreams and the fragility of life. And of course, Instagram loved it. A few months later, I asked Miss Pickering for some help with my photography during a 121 session. We talked about light sources and exposure and I did make a little progress. But I still had work to do. It occurred to me that, sometimes on a course I am so relieved at the point I have produced something beautiful, that by the time it comes to learn how to document it, I am already emotionally exhausted. Or something like that (perhaps a bit less dramatic, but along those lines). So I made what turned out to be an excellent decision in that I booked two days that focussed on photography and styling, ones that didn't require me to first pour all my energy into creating something. I attended first of all, the Green and Gorgeous flower photography day, led by the excellent Clare West (which focussed on photography with some styling) and then a day of Styling for Florists hosted by A Quiet Style (which started with a little photography but focussed mainly on styling). 1. When considering the ever present and much discussed triangle of exposure, for us floral designers, it is the depth of field that matters the most. That's the F stop thingey. It is really important, especially when photography moody photos of dahlias (see above). 2. Choose backgrounds carefully. The bouquet above is set in front of a really lovely textured and weather beaten grey wall. The styled board at the beginning of this post is in on top of some lovely coarse jute. Wooden boards and linen also work well. 3. Obey the Rule of Thirds. I knew this already, but when I actually put it into practice rather than just thinking about it, it really does make a difference. The above is just a very small sample of what I learned from Clare and Emma. Clare succeeded where so many others had failed before her, in that she got me to focus as well as my camera, no mean feat. And if you want to know your flat lays from your uprights, I can't imagine a better teacher than Emma. I stuffed a bag full of my favourite props at 6.05 am and grabbed some hellebores from a jug in the kitchen before jumping on a train to Brighton. After an hour of listening to Emma, I emptied out my bag á la Ally Sheedy in The Breakfast Club and created the image at the start of this post in less than 20 minutes. Later on, after more tweaking and listening, I created the scene below in just under 15 minutes. I still don't really know how, but everything Emma said made so much sense and I was surprised that I hadn't panicked or even needed much help (ok, just a little) when putting her advice into practice. I left feeling so happy and inspired - and I may also have come a full circle since, just as my first attempt with Katie had me hitting the Silk and Willow website really rather hard, so today I have been adding to my props stash at an alarming rate - expect to see 19th vintage French secateurs, a white linen and lace tablecloth, even more flower books and botanical illustrations and of course some vintage ribbon spools coming to an Instagram account near you very shortly. Meanwhile, I'm off to organise my grid.